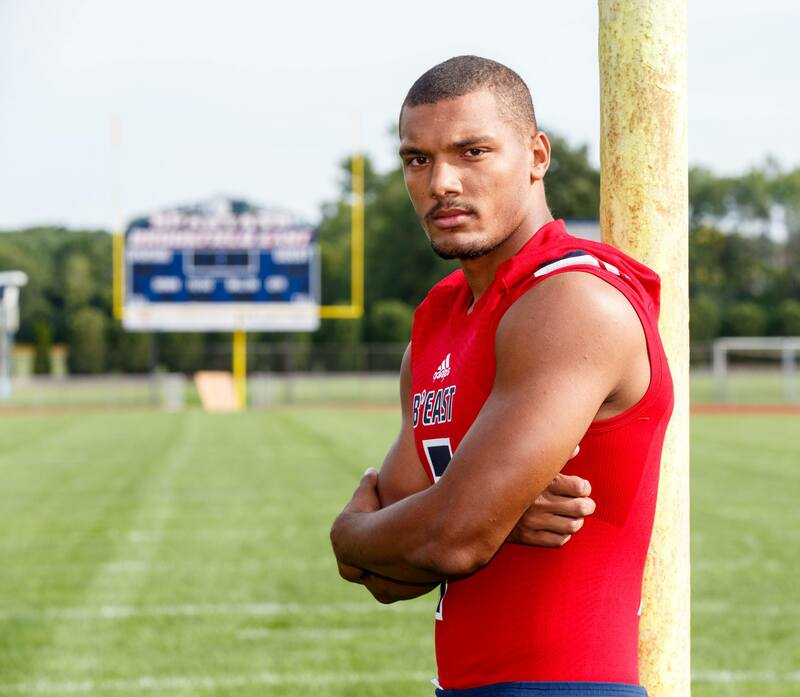 He swam and he wrestled growing up, but Brookfield East All-Greater Metro Conference Defensive End Caleb Wright didn't play football until his freshman year. So what took you so long, Caleb? "Football was something I always wanted to do," he said. "I just felt I didn't have the time for it. Swimming was a big thing for me. When I decided I wasn't going to swim anymore, that's when I decided to play football. "All my friends were playing football. They highly encouraged me to play football because I was a bigger person. I fell in love with the sport - the physicality of it. I was able to showcase my athleticism." Wright still was able to wrestle at East and he finished fifth in state at 220 as a junior this past season. 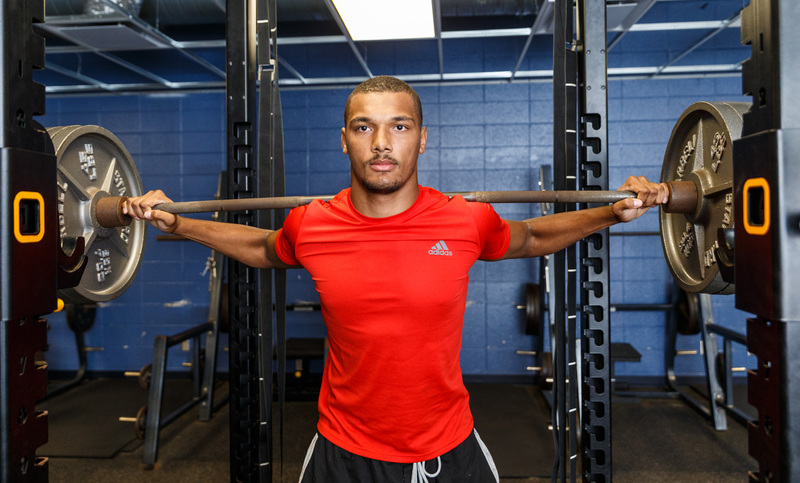 As several football players do, he also went out for track and took second at state on the 4x2 relay team last spring. East coach Ben Farley remembered the first time he saw Caleb play football. "It was a summer workout as a ninth grader," he said. "He looked more like a senior in high school physically. Then I learned this was his first year of playing football. We knew we had this great body frame we could work with but he was also someone really raw." Wright played on the freshman team and was promoted for the playoffs his first year. Then as a sophomore, he had 24 solo tackles, 39 assisted tackles for a total of 63 tackles. He also had 11 tackles for losses and 6 sacks, making a big impression. Caleb pointed out it took an injury to make him a defensive lineman. "Initially I was a linebacker and wide receiver," he said. "One of our defensive lineman got hurt and was out for the season so they moved me to defensive lineman and then that's when I knew I was really going to help the team out. That was more of my natural position and I just got the hang of it quick. "I like how it's very versatile. You can be fast and strong. There's a mental side to it too where he have to be mentally tough and smart at the same time." He helped the Spartans finish second with a 6-1 record, 10-2 overall record, losing to Homestead, 35-25, in a level 3 playoff game to close out his sophomore year. Photo by Alan Herzberg, SportsPhotos LLC --- When talking about Brookfield East's Caleb Wright, the world athleticism always seems to come up. "He has the frame, the height, the body," Farley said of Wright playing defense. "We ask a lot of our defensive ends and we saw potential there with Caleb. It was a natural fit for him to come along and learn the game of football and also to use his physicality at the younger levels and then progress through the ranks. We just thought it was a good fit." Last year East finished third behind Brookfield Central and Marquette, co-GMC champs, with a 5-2 record, but the Spartans went 12-2 overall, winning their final six games. The Spartans finished that streak by defeating Monona Grove, 42-36, to win the WIAA State Football Championship. Caleb was first-team All-Greater Metro Conference Defensive End, getting 44 tackles and 44 assisted tackles for a total of 88 tackles. He had 9 tackles for loss, a team-leading 8 sacks and a fumble recovery. "You look at this past spring in track. He's 235 pounds and he's winning hurdle races, he's throwing and he's in relays," Farley said. "You just know that you've got a really good athlete. I don't think there was one particular moment here or there (that we knew he how good he was), but it's how he carries himself. I was really impressed with him." "My biggest strength is being a leader on the field," he said. "When the guys are down after something, bringing them back up. That's my biggest strength. Also to be a good role model as a football player. Use it as a tool for younger people to look up to." He then talked about his physical strengths on the field. "I'm a faster lineman. I use my speed to get around the edge," he said. "I have a quick reaction time to deal with lead blocks and get through." But he knows he's not perfect. "I want to work on my durability," he added, "So I can go 100 percent every single play." Farley focused on Wright's athleticism as well as his leadership skill when asked about his strong points. "His strength, speed and quickness. You look at those athleticism traits," he said. "When we test, he will test off the charts. He's good in the 40, the bench press, squat, clean, those types of things. Caleb and (linebacker Brad) Dati were some of the few underclassmen who served as captains last year (Farley has game captains, not season-long captains). Photo by Alan Herzberg, SportsPhotos LLC --- Brookfield East's Caleb Wright will also take his skills to the offensive side of the ball, playing some running back this season. "It was really fun to see him grow in his leadership role and become more vocal," Farley said. "He's always been a really good leader by example; being the first guy in line, challenging other kids. It's fun to watch and see his development in the leadership aspect." Wright feels leadership is a very important part of his job, recalling his earlier years. "It's extremely important. I know, because when I was a freshman I looked up to people who set good examples," he said. "So now I can be that person and people look up to me in a certain way." Caleb talked about the type of leader he is. "I'm a leader who likes to lead from the back and give people the right tools to lead themselves. "When I see something that can use a little fixing technique-wise, I'm not afraid to go and tell them 'Hey, this is how the coach wants us to do it. Go with what the coach said because he's our coach." He will also work on the mental part of the game with a player. "If someone has an attitude situation, you do it where you're not pushing a person where it's not doing them any good," he said. "I do tell them to keep their head up. There are more plays to be made." Caleb will probably see more time on offense this season with the loss of super back Sam Santiago-Lloyd. "Last year I also played a little bit of fullback and now this year I will also be playing defensive end and running back. It was my first year where I really got reps at running back. "This year I'm excited to play running back. It's a fun position. You get to run around and hit people. It's definitely kind of nerve-wracking because I'm kind of new at the position. I'm not used to changing direction and avoid people basically. I'm definitely getting the hang of it and I'm confident of myself getting the job done. "I definitely enjoy defense more. I'm not the biggest fan of trying to run a lot, just being a bigger guy." But Farley knows where Caleb's strength lies. "He is someone who is extremely physical, hard worker," he said. "A very conditioned athlete. This year he will still be at defensive end, but we'll move him around in the defensive line because he is such a strong asset for us and a tough block. "We also could be seeing him playing a little fullback. We can see him running the football, just taking advantage of his skill sets. This year from the start we're starting to develop his skills on the offensive side of the football." Farley also talked about Caleb as a person. "You meet the young man; he is humble, down to earth, a good kid, smart and extremely hard working," he said. "We knew we had the potential for something special. Caleb has done nothing but work hard these last four years." MOST MEMORABLE MOMENT: His junior year overall. Winning State Division 2 Football Championship, finishing second in state on 4x2 relay and fifth in state at 220 pounds in wrestling. WHAT DO YOU WANT TO DO IN THE FUTURE: Has a scholarship to play football at Northern Illinois and wants to study Criminal Justice.